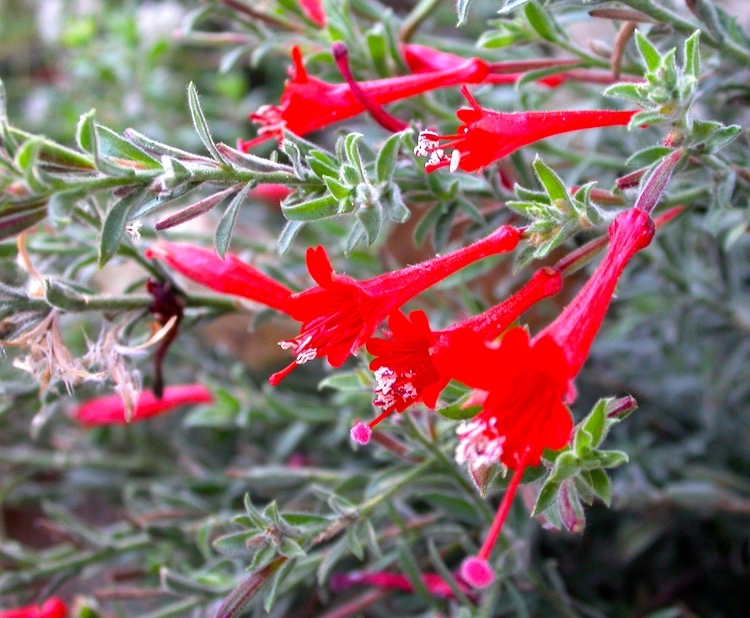 Epilobium canum, also known as California fuchsia or Zauschneria, is a species of willowherb in the evening primrose family (Onagraceae) [to which the genus Fuchsia also belongs]. It is native to dry slopes and in chaparral of western North America, especially California. It is a perennial plant, notable for the profusion of bright scarlet flowers in late summer and autumn [that is to say, now]. 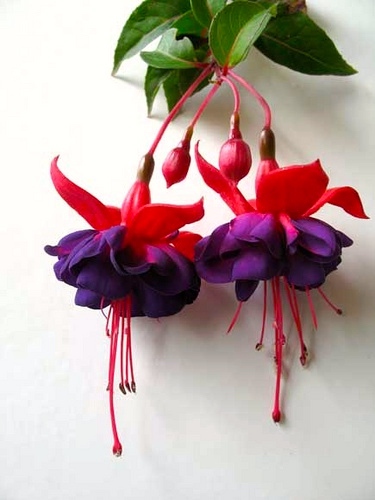 The genus Fuchsia is far from uniform: it takes in about 110 species, mostly of shrubs or small trees (typically no more than 2 pr 3 ft high). The horticultural plants (like the one below) are hybrids of several species. (#3) Honeysuckle fuchsia, firecracker fuchsia, etc. What you do in your garden, from applying fertilizer to planting a lawn, affects the Bay. 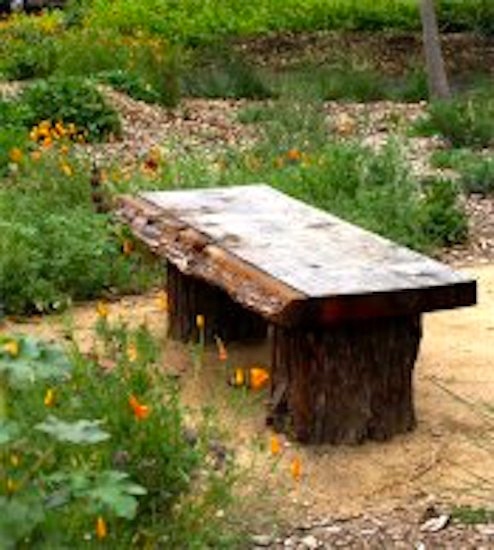 This garden demonstrates environmentally friendly landscaping using Bay-Friendly practices – a holistic approach that works in harmony with the San Francisco Bay Watershed. Bay-Friendly Principles incorporate the fundamentals of water conservation, zero waste, greenhouse gas reduction, energy conservation and storm water runoff pollution prevention. These practices help the community and City achieve goals for sustainability. This entry was posted on August 29, 2017 at 5:04 am and is filed under Compounds, Language and plants, Names, Subsectivity, Technical and ordinary language. You can follow any responses to this entry through the RSS 2.0 feed. You can leave a response, or trackback from your own site. 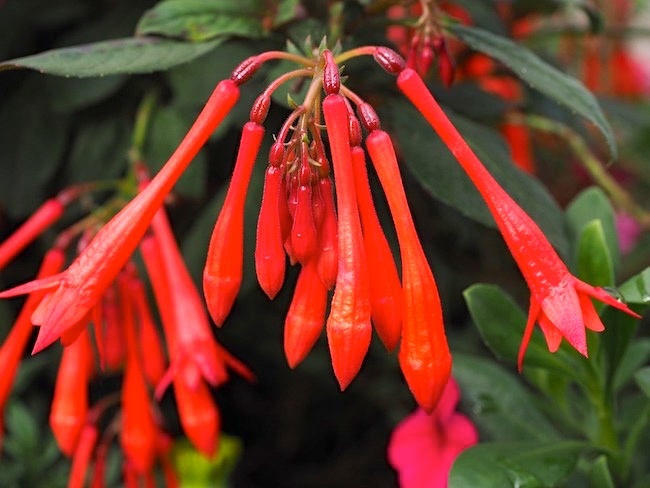 I bought a perennial this spring that was labelled as a Fuchsia variety, upright rather than trailing, the flowers looking rather like the Fuchsia triphylla depicted in #3, maybe a bit more orange.. I had hopes for it, since its label said it would tolerate partial shade. Unfortunately something — I suspect a rabbit — ate most of it recently, and I don’t think it’s going to survive.